Prices:	Due to the ever present fluctuation of material and labor costs, our prices are subject to change without notice. Terms:	All orders are C.O.D., cashier’s check or credit card unless prior arrangements have been made. We accept Mastercard and Visa only. Any account responsible for a returned check will be placed on C.O.D. money order/cashiers check only and will be charged a $20.00 returned check fee. Any business open account with an unpaid balance over 90 days will be placed on C.O.D. Shipping: All orders will be shipped UPS ground unless prior arrangements are made. Remember we are located in California so if you are located far from us you may want to request faster service. It may take a week for packages to reach the east coast. The carrier has full responsibility for all merchandise once the package leaves our facility. All damage or shortage claims must be reported to the carrier immediately. Inspection by Customers: The Customer acknowledges that they will inspect the materials immediately upon receipt from Manton Pushrods/Manton Racing Products within 5 working days of delivery. Any alleged damage, shortage, deficit or otherwise. Failure by customer to make any claim within such time shall constitute acceptance of the materials and waiver of all such claims. No returns will be accepted without prior authorization. Any merchandise returned due to manufacturing defect or shipping error will be corrected at no charge. All orders that are custom made are NOT RETURNABLE. All other returns are subject to a 15% restocking fee. 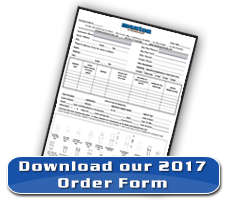 When ordering pushrods there are many factors in determining the correct pushrod for your application. Many questions will be asked of you during the ordering process. The correct answers to these questions are the responsibility of the customer. We will do our best in suggesting the proper pushrod for your application, but the final decision is the responsibility of the customer. Manton Pushrods will not be held responsible if the pushrods do not fit properly when you receive them unless it is due to a manufacturing error on our part. Manton Pushrods/Manton Racing Products will repair or replace at our discretion any item manufactured by our company that is found to be defective in material design and/or workmanship. The invoice must accompany the merchandise to verify the purchase. We reserve the right to inspect any merchandise returned for misuse, abuse, modification or defective installation. 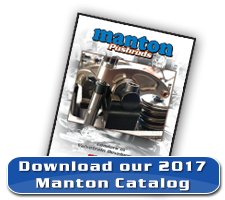 All merchandise distributed by Manton Pushrods/Manton Racing Products is guaranteed in accordance with the manufacturers own terms of warranty. Due to the intended usage of the products sold by Manton Pushrods/Manton Racing Products they are sold WITHOUT WARRANTY OR ANY IMPLIED WARRANTY OF MERCHANTABILITY OR FITNESS FOR THE INTENDED PURPOSE. Manton Pushrods/Manton Racing Products shall not under any circumstances be liable for any special consequential or incidental damages, including but not limited to loss of profits or revenue, loss of other property or equipment, cost of purchased or replacement goods, or claims by customers of the purchaser which may arise and result from the sale, installation or use of these parts. Installation of parts intended for “off-highway” use could adversely affect the vehicle manufacture’s warranty coverage. Manton Pushrod/Manton Racing Products reserves the right to make changes in design, specifications, materials, or make product changes without incurring liability or obligation with respect to similar product previously manufactured. If technical advice is offered or given in connection with the use of any products it will be as an accommodation to Buyer and without charge and Seller shall have no responsibilities or liabilities whatsoever for the content or use of such advice.